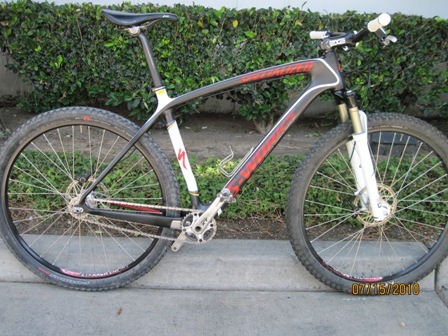 Thread: SS Wheels for 2010 Stumpy? I have a 2010 SWorks Stumpy carbon SS with some sweet Edge bars and stem XT cranks and brakes and currently running King hubs with Stans Arch rims. The frame is super stiff and yet smooth to ride. I think the wheels are flexing or something. My question is what would be a good SS wheelset to complement this beutiful ride yet still be ride worthy? Oh I do like to race a few 12hr races each year and I could make the Clyds class FYI. Seriously? Those are really nice wheels. Maybe go with Flow rims instead of the Arch? The king hubs are not the culprit of the flexing. Unless you are ridiculously wealthy I can't see anything working better than the setup you have unless you sacrifice a ton of weight and i doubt you would be willing to do that since you have a carbon frame and race from time to time. Wow...we have exactly the same setup, sans handlebars. Culprit could be spoke tension. But, if you're looking for an excuse to build up the ultimate wheelset to go with the ultimate SS frameset, Edge makes some great hoops that can be built up to an ultra light [esp. for your wallet] and very stiff wheelset. You might be on to something. A friend switched from Arches/XT wheelset to a Stan's ZRT Race 29'er wheelset, and found them noticeably stiffer. All I could figure was spoke tension. Great tip I will check the spoke tension first. Thanks. I considered the Edge hoops but they seem to have a long wait time for them. I will inquire at my LBS for them. I dont see many I-9's that I like and what if I bust a spoke or three somewhere where its not easy to find a replacement? Anyhow, thx for the advise. Maybe a heavier spoke build would help? And tension does make a difference...for whatever reason I had to have my AC/Arch wheelset retensioned every few months. And right after I had that done each time you could feel the rear wheel was much more stiff and responsive (less wind up). Boxer, do you have any pics of your bike? I am starting to consider carbon as a frame option and would like to see how you have set yours up. PM me if need be. I think the spokes maybe the issue. Trying to attach a photo. change to 355 rims. they are a bit lighter and just as nice. it is more than likely spoke tension though. 355 are fleckier than arches. From the picture it looks like a 26r to me but according to Specialized they only make the SS in a 29r. Correct? Looks good but I will be looking for a 26r. Yes it is a 29er. I am having a funny vibration from the rear brake area, trying to figure it out. Fun ride, super stiff and great climbing SS. I have the crest on ZTR hubs on my speshy SS and they are working great. The spokes were really loose so the LBS retensioned the rear and front and now it feels great. They recommended checking the spoke often due to the SS and 29" size. Awesome! Much cheaper solution for sure!